Geishas at their Traditional Rituals. c.1920. - Woodblock. Original colour. Size: 23 x 33 cm. (9 x 13 inches) Very good condition. Framed size: 48 x 37 cm Original Japanese woodblock prints. 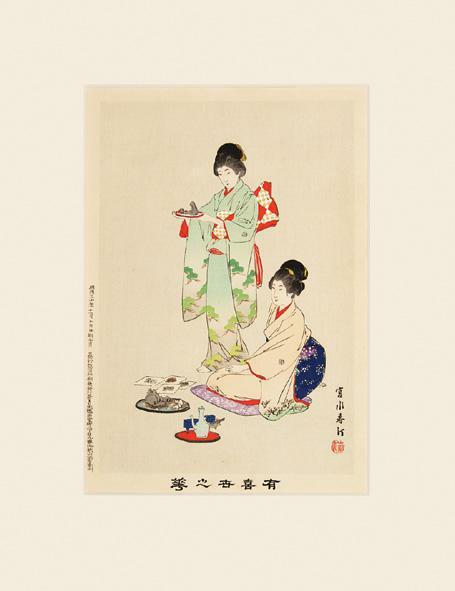 Vibrantly coloured print of young geishas in traditional costumes. 1920 - Gouache, Feder, Farbstifte und Bleistift 42,5 x 58,5 cm Provenienz: Emily Kley (Witwe des Künstlers) Privatbesitz, München BIOGRAFIE: Heinrich Kley (1863 Karlsruhe - 1945 München) Nach Beendigung des Studiums an der Karlsruher Kunstschule 1885 ist Heinrich Kley darum bemüht, sich im Kunstleben seiner badischen Heimatstadt zu etablieren. Zwar erhält er immer wieder Aufträge von ortsansässigen Privatpersonen, Behörden sowie Unternehmen, engagiert sich in der lokalen Künstlerschaft und nimmt an Ausstellungen teil, doch bleiben größere Erfolge letztlich aus. Diese stellen sich erst nach 1900 ein, als das Unternehmen Krupp in Essen auf Kleys Fähigkeiten als Schilderer topographischer Sujets aufmerksam wird. Durch die Verbindung von zeichnerischer Präzision und koloristischem Feingefühl gelingt es ihm, die spezifischen atmosphärischen Stimmungen in der Welt der Gußstahlfabriken, Hüttenwerke und Schiffswerften einzufangen. Seine um impressionistische Elemente bereicherte realistische Kunstauffassung überzeugt bald auch andere große Unternehmen, so dass Kley innerhalb weniger Jahre den Ruf eines erstrangigen und vielbeschäftigten Industriemalers genießt. Der breiten Öffentlichkeit wird Kley durch die Mitarbeit an den Zeitschriften Simplicissimus und Jugend bekannt, die ihn 1909 zum Umzug nach München bewegen. Bis zum Ersten Weltkrieg veröffentlichen sie hunderte seiner humoristischen, satirischen und grotesken Federzeichnungen. Themen der Gesellschaftspolitik, des technischen Fortschritts sowie des Verhältnisses zwischen Mann und Frau erfasst er mit phantasiereichen Bildideen, psychologischem Einfühlungsvermögen und unverwechselbarer Virtuosität. Mit gleicher Könnerschaft charakterisiert er menschliche Verhaltensweisen durch Mensch-Tier-Vergleiche pointiert und unterhaltsam. Obwohl es nach dem Ersten Weltkrieg ruhig um den von Schicksalsschlägen getroffenen Künstler wird, erfahren seine Federzeichnungen eine erstaunliche Rezeption in den USA. In den späten 1930er Jahren wird Walt Disney auf sie aufmerksam und nutzt sie fortan als wichtige Inspirationsquelle für seine Zeichentrickfilme. So lebt Kleys Kunst in den Figuren von &#132;Dumbo&#147;, &#132;Fantasia&#147; und &#132;Dschungelbuch&#147; weiter und begeistert weltweit ein Millionenpublikum. (William Muir, 1920). Small quarto. (8)ff. One of only thirty-two copies of this facsimile edition, according to Quaritch catalogue 693, this being copy Number One. Signed by the publisher, William Muir, on the front cover. Although not seen here, several copies of this 1920 edition included a note hand-written by Muir inside the front cover stating, "This book is copied from a very richly coloured original which was lent to me by Mr. Bernard Quaritch ... in 1887. I now issue this edition of fifty copies through Messrs. Quaritch of Grafton Street. London, August 1920." The original lent to Muir was Copy J, now held at Harvard's Houghton Library, and Muir never completed the full fifty reproductions. It is interesting to note the differences in Muir's 1885 facsimile of The Book of Thel, which was based on Copy D, and this 1920 edition, based on Copy J. D was printed in yellow ochre and has much more muted colors; in contrast, Copy J was printed in dark green and the colors are significantly more vibrant. Muir accurately reproduced these differences in his own reproductions. The Book of Thel was Blake's first illuminated book written in fourteen-syllable lines, a form he used for many of his later books. The book speaks to life's transience, to fears of death and sexuality, and to the human desire for transcendental truths. Near fine in the original wrappers, which show some wear to the yapp edges; text block loose in wrappers but still attached. Housed in custom slipcase with bookplate of Philip Hanson Hiss. (Blake Archive). Sibylle, die gewandte Kartenschlägerin, oder neuester Schicksalsprophet, worin die Kunst der Wahrsagerei aus den 32 deutschen Spiel-Karten so deutlich gezeigt wird, daß sich jedermann in sehr kurzer Zeit, ohne fremde Hülfe die Karten selbst legen, oder andere damit unterhalten kann : ein Gegenstand der Neugierde, eine Unterhaltung für Einsame, ein Trost für Leidende, ein Rathgeber für Liebende und Verliebte. Zweite verbesserte Auflage. Mit 7 (1 gefalt.) kolor. lithograph. Tafeln. 52 S. HLwd. um 1920. Diese Ausgabe in Bibliotheken nicht nachweisbar im "Allgemeinen Anzeiger und Nationalzeitung der Deutschen" vom 15. Jan. 1840 wird das Werk als soeben erschienen angezeigt. - Mit Exlibris der tschechischen Opernsängerin Emmy Destinn (1878-1930). - Etwas fleckig. Washington, D.C.: Government Printing Office, 1920. First edition. Paperback. Very Good/Good. Softcover. Disbound. Original brown tattered and torn dust wrapper is in a Mylar sleeve around the book. Binding is tight but there is no backstrip on the book. Pages are clean, unmarked, unyellowed. 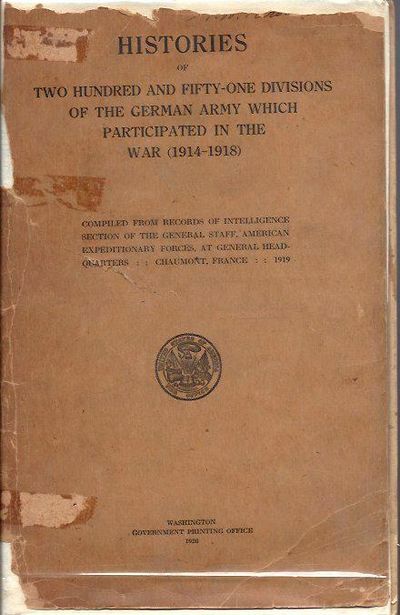 The book contains the record of the organization and service of the 251 divisions of the German Army during the years 1914-1918. Compiled from records of Intelligence Section of the General Staff, American Expeditionary Forces, at General Headquarters; Chaumont, France 1919. A scarce document in its original form. 8vo. 748 pp. New York: G.P. Putnam's Sons, 1920. Hardcover. Very Good +. Ann Fish. 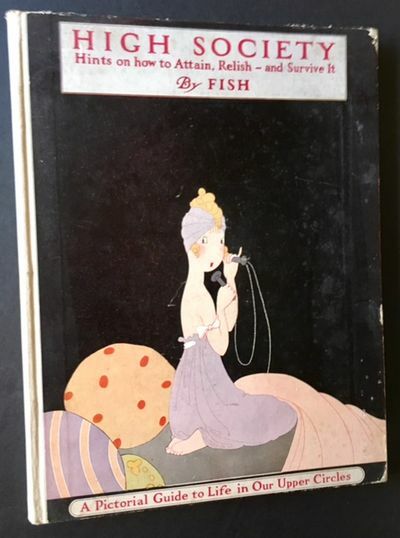 A wonderful send-up of post-World War I New York high society, brilliantly illustrated thruout by the English cartoonist Ann Fish. Solid and VG in its highly-decorative boards, with light soiling --and just a touch of staining-- along the rear panel and light wear to the front tips. Still though, solid and very presentable. With predictably stinging observations by Dorothy Parker, Frank Crowninshield and George S. Chappell. 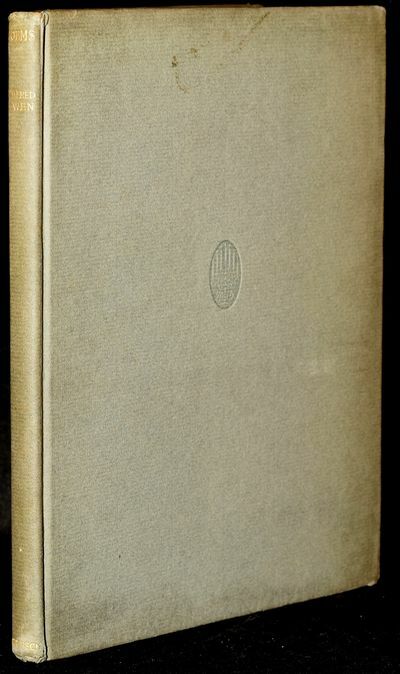 (From the title page: "Advice as to Social Campaigning, and Hints on the Management of Dowagers, Dinners, Debutantes, Dances, and the Thousand and One Diversions of Persons of Quality"). 1920 - with his pencilled signature, inscribed and dated on the margin in Irene's hand "Iris & Irene. 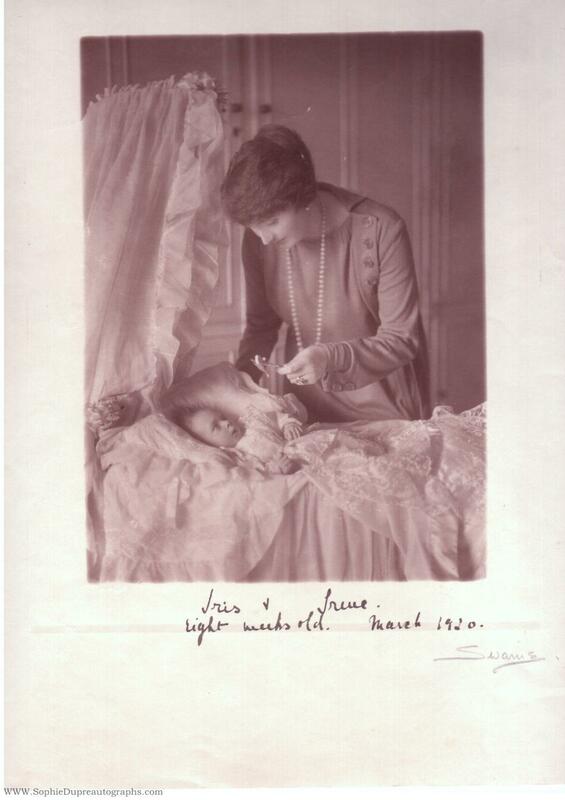 eight weeks old", showing Irene half length, holding up a toy to her baby in the cot, who wears a long lace gown, 8" x 6" in margins 13¼" x 10¼", London, March three tiny white marks on image From the collection of Queen Victoria Eugenia of Spain. Irene's husband 'Drino' grew up at Osborne, where his mother, he, his brothers and sister Ena, lived with Queen Victoria. Iris was Queen Ena's only niece or nephew on her side of the family. 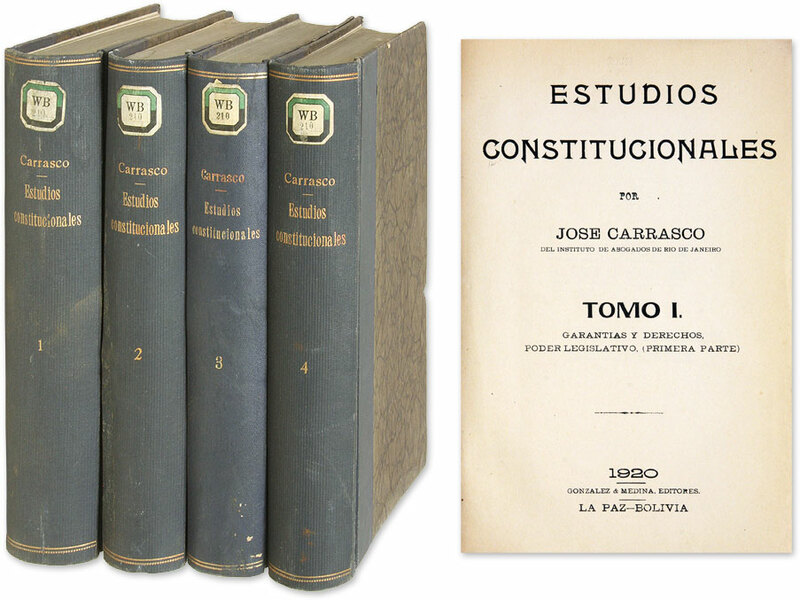 Estudios Constitucionales, 4 Volumes, Complete Set. 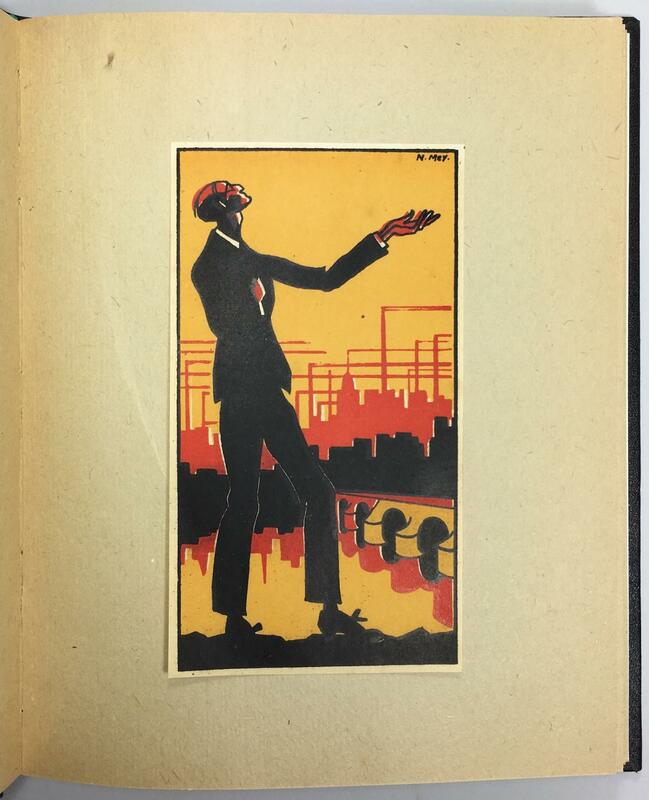 Cambridge, England: Cambridge University Press, 1920. Ex-Library; Full black cloth, gilt titles on spine, xxiii, 527 pp, index. Covers somewhat scuffed, corners bumped & worn, previous owners' names on ffep & name of library (apparently 2nd of 3 owners) stamped on edges. Forsyth graduated from Trinity College, Cambridge, as senior wrangler in 1881, and was Sadleirian Professor of Pure Mathematics from 1895 to 1910. 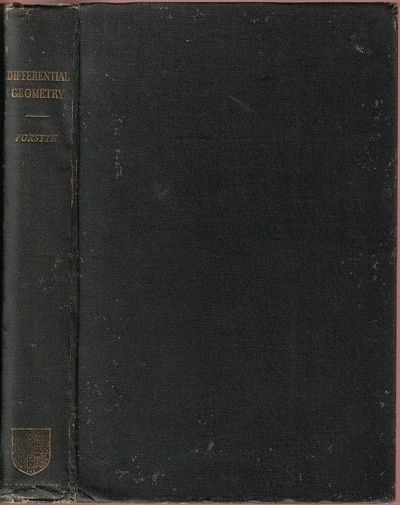 Contents: curves in space; general theory of surfaces; organic curves of a surface; lines of curvature; geodesics; general curves on a surface, differential invariants; comparison of surfaces; minimal surfaces; surfaces with plane or spherical lines of curvature, Weingarten surfaces; deformation of surfaces; triply orthogonal systems of surfaces; congruences of curves. Shipping weight 3 lbs.. 2nd ptg with minor revisions. . G/No dj. 26½ X 18 cm. 8vo., original cloth backed paper covered boards lettered in green on upper board. Repair to tear on gutter of title-page otherwise a very good copy. First edition. Inscribed by the author. A series of 38 humorous fictional letters between an investor, Dave, and his broker Eddie. While satirical in tone, the letters offer insights into the worries and frustrations inherent in playing the stock market, and foreshadow the crash and subsequent depression that would come ten years later. "A. Kustomer" was the pseudonym of Jacques S. Cohen. At the time of the book's publication, Cohen was the head of the Statistical Department at J.S. Bache & Co., a securities firm, and later worked at the firm of Baar, Cohen & Co. He also wrote numerous articles for The Financial World, also published by The Guenther Publishing Co., which was run by Louis Guenther. Louis Guenther is perhaps best known for the libel and blackmail suit he was embroiled in during the beginning of the twentieth century. In 1911, George Graham Rice, himself a known con artist, published an article in the magazine Adventure (owned by the Ridgway Company) accusing Guenther of using The Financial World as a blackmail scam, supposedly threatening various businesses with bad press if they refused to purchase advertising. Guenther fought back, ultimately winning a libel suit against The Ridgway Company in 1915. A few years later, Jacques S. Cohen, apparently unfazed by Guenther's supposedly unsavory business practices, began publishing his "Eddie from Dave" letters in The Financial World as well as articles under his own name. Apparently unaffected by the scandal, The Financial World continued publishing until it folded in 1998. From the library of Harry Hoffman, presumably the same Harry Hoffman who was World Secretary of the American Exchange National Bank in New York in 1922. The inscription, which reads, "Harry Hoffman: To my friend and counsellor. Who if he had wisely counselled, perhaps I would not have written this book--Jacques S Cohen Dec 8/1920", is the only indication that Cohen was indeed the author. Even James L. Fraser, an investment counselor who self-published a revised edition in 1966, did not know the identity of "A. Kustomer". He writes in his introduction that even Richard Anderson, then-editor of The Financial World, knew nothing of Kustomer's identity, and that it is, "one of the many little mysteries that often crop up when one digs into Wall Street's past." In 2013, the book was revised, annotated, and privately reprinted again as Letters to My Broker: P.S. What Do You Think of the Market? by Clem Chambers, a financial pundit as well as CEO of ADVFN, a financial market website. He too, did not know the identity of the original author. These reprints are a testament to this odd and obscure little book's enduring relevance to the financial world. Eos. Eine Dreimonatsschrift. Herausgegeben von Emil Pirchan. Erstes Jahr, erstes Heft: Ekstatik. Erstes Jahr, zweites Heft: Mystik. - Ein Ausdruckswerk ringender Kunst. Drittes Buch: Phantastik. Viertes Buch: Symbolik. Imp Duruy & Cie & Villain & Bar 1920 - Original poster. Color lithograph. 45.5 x 31 inches. 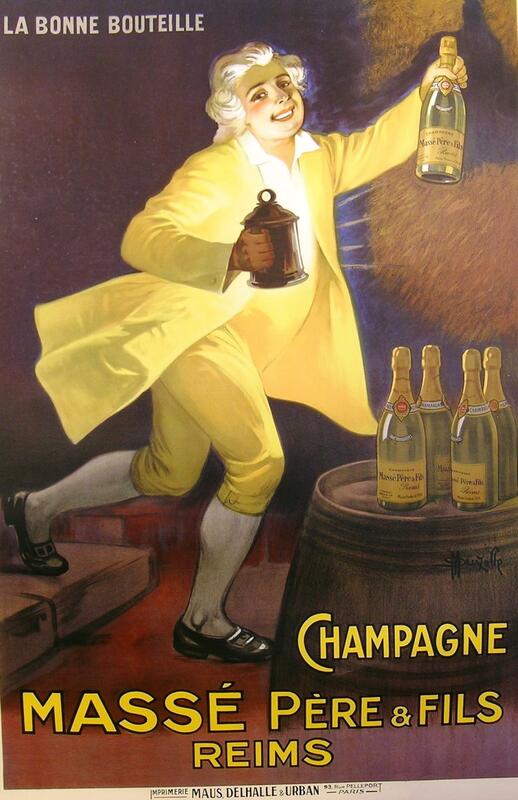 A French poster advertising the National Loan of 1920. Following the War Loans raised each year of the conflict from 1915 onwards, the French government issued a further loan in 1920, to contribute towards payment for the reconstruction of the country. 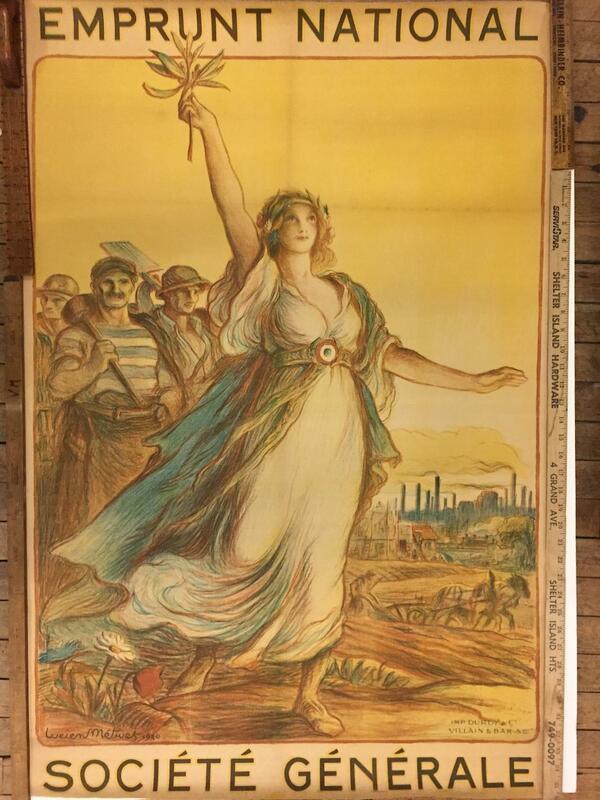 In this poster the figure of Victory - with a belt clasp in the form of a French roundel - holds an olive branch above her head and is leading a group of workmen. The landscape in the background shows both scenes of farming and industry. Lucien Metivet (1863-1930) was a French cartoonist, illustrator, and author active during Belle Epoque. He was particularly known for his covers of the Parisian satirical magazine "Le Rire". Good condition, mounted on linen. 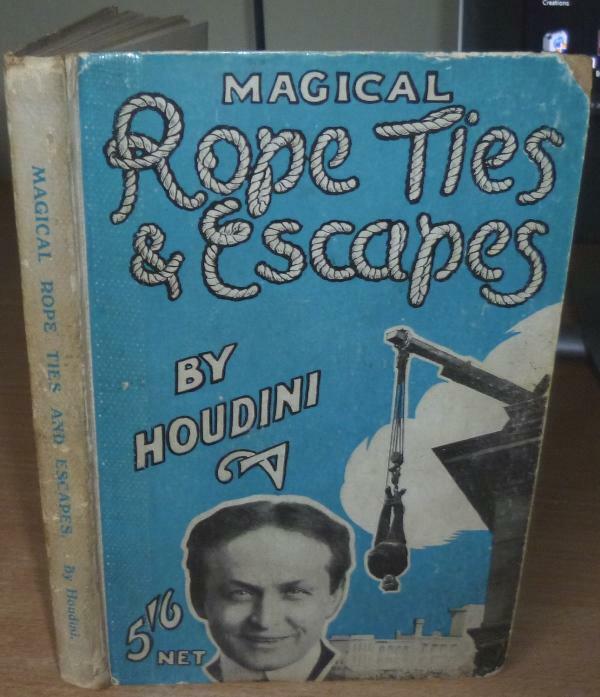 Magical Rope Ties and Escapes by "Houdini". Doubleday, Page & Company, Garden City, NY 1920 - Some of the titles in red and black. This edition is limited to 735 copies of which ours is No. 58. The first volume is signed by the author. 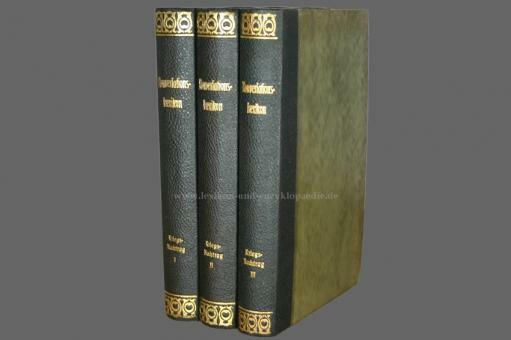 This edition has 4 extra volumes whereas the English equivalent was published in only 20 volumes. Contemporary half navy morocco over blue linen, boards ruled in gilt, spine in 6 compartments, decorated with ships and anchors in gilt. A superb set in the finest condition. 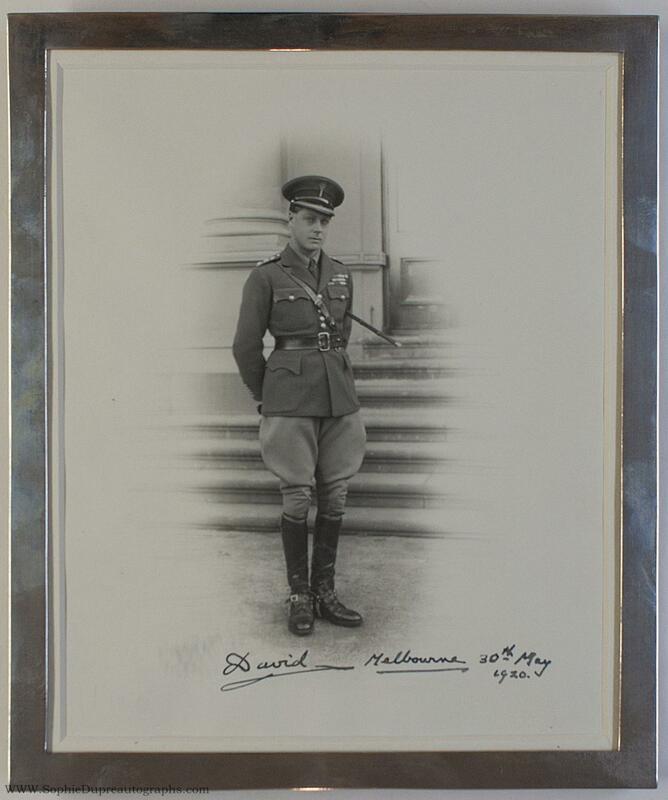 London: Philip Lee Warner for the Medici Society, 1920. First trade edition. Hardcover. Very good/Very good. 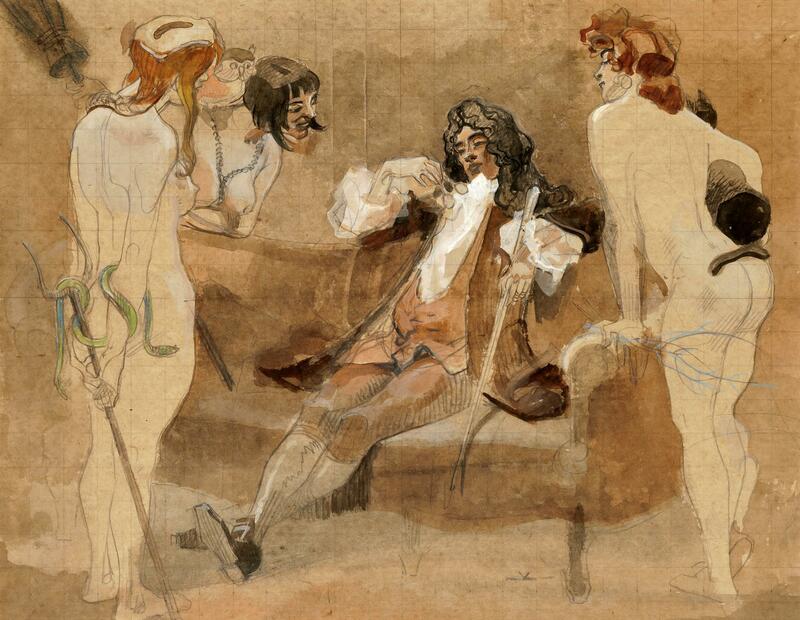 Illustrated by W. Russell Flint.. 4to. Two volumes. 24 full color plates by Flint. 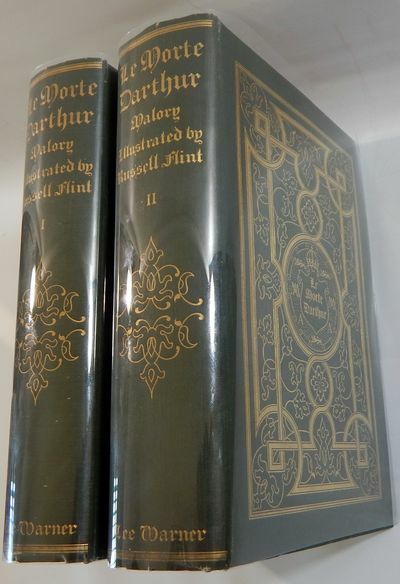 Green cloth, gilt spine title and gilt design on the upper boards. Top edges gilt. There is a small bump on the rear board of volume 2, and trivial traces of wear to the edges and corners, else this is a bright, near fine copy and one of the nicest we have seen. With the bookplates in each volume of Robert Turner Young. 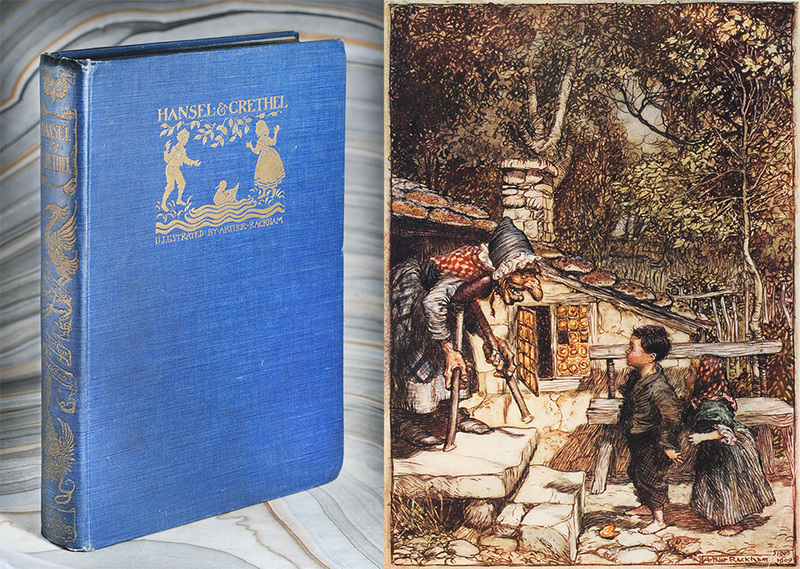 The Russell Flint illustrated edition of Malory first appears in a limited four volume edition in 1910-1911. 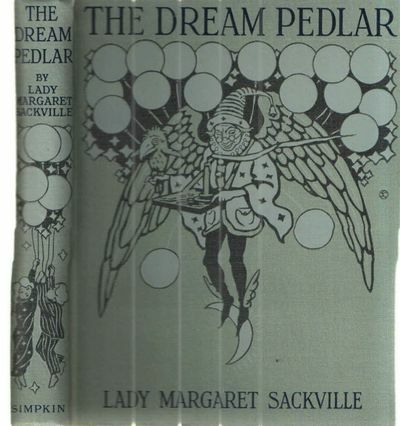 This is the first trade edition, in two volumes, many times reprinted. There was also a later one volume edition also many times reprints. 1920. A photographic record of American historical handkerchiefs, the basis of a book that was never published. This collection of approximately 460 black & white photographs was taken with the intention of Edwin Lefevre, an avid collector, of publishing a book on the subject. He sought help from other collectors - a form letter in the collection states "I am writing a book about American historical handkerchiefs. This includes those used in presidential campaigns or commemorative of battles or notable political, social and educational events or famous persons. ... I am writing to you in the hope that you will let me know whether you own or know of any such handkerchiefs." Although Lefevre did receive generous help from various collectors, the book was unpublished as far as we can ascertain with a thorough check of OCLC and auction records. Lefevre was an interesting character, a Panamanian/American journalist, writer and diplomat most noted for his writings on Wall Street business. His books were popular and remain highly collectible. His family lived in Atlantic City and the Wikipedia entry states that in 1908, he and his family moved to East Dorset, Vermont. He collected and apparently dealt in historical handkerchiefs and historical flasks and bottles. 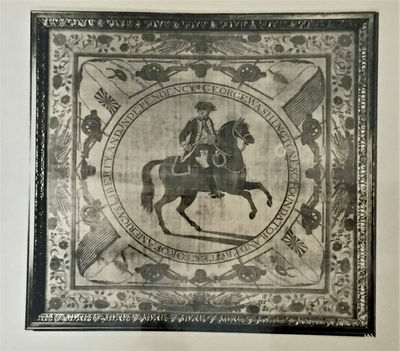 We have found one auction record of a "Bandana depicting the Battle of New Orleans, circa 1815-1816" which sold at auction in 2003 for $4200. 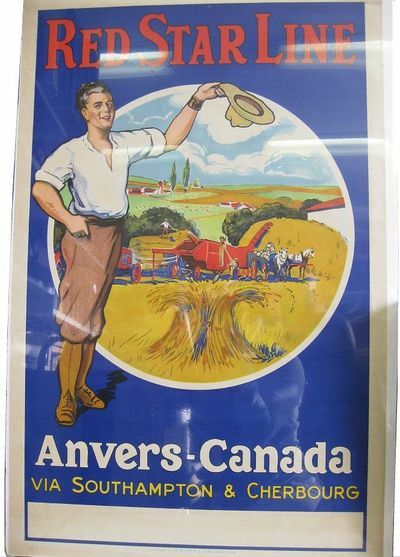 The provenance is listed as "Purchased September 23, 1937 for $150 from Edwin Lefevre." (Rare Book Hub record number N07867-1013). In the Joseph Downs Collection of Manuscripts and Printed Ephemera at the Winterthur Museum, references to Edwin Lefevre in 1939-40 appear in the papers of Samuel H. Laidacker, an antiques dealer. (Finding_Aids/COL0064.htm) Lefevre wrote an article in 1939, "Washington Historical Handkerchiefs", which appeared in Antiques, 36 (no.1): 14-17. The article was referenced by Raymond B. Clark, Jr. "Historical Handkerchiefs" in 1955 "currently a Henry Francis DuPont Winterthur Museum Fellow" who was shortly to receive his MA in early American Culture from the Univ. of Delaware. In the 3rd paragraph, he states "The definitive monograph or book on historical handkerchiefs has not been written." Lefevre has written his name and Atlantic City address inside the cover of the binders. There are his manuscript notations on the verso noting collectors and other research and information. Many handkerchiefs are in the Lefevre's collection, so noted with either "E.L." or "Coll of E.L." on the verso. Other collectors include Henry DuPont, Mrs. J. Insley Blair, Mrs. J. Amory Haskell, Boston Museum of Fine Arts, Harry M. Bland, Mrs. G. Bilhuber, and G. H. Lorimer (an early editor of The Saturday Evening Post, whose collection of historic bottles is in the Philadelphia Museum of Art.) Often, Lefevre has noted the size, color ways & research on the verso of the photographs. The collection is housed in three large albums and one small one. Much of the first album is devoted to the Declaration of Independence, George Washington & famous battles, and popular subjects. The last third of the album and the full second album are of many presidential candidates and their opponents including Andrew Jackson, William Henry Harrison, Abraham Lincoln, William McKinley, Benjamin Harrison, Tyler, Grover Cleveland, James Garfield, Teddy Roosevelt, Herbert Hoover, a youngish Franklin Delano Roosevelt. The third album is largely sporting events, kerchiefs for children, including one for teaching sign language. The 450 large photographs measure approx. 9 3/4" w x8", mounted on linen-backed pages measuring approx. 11" w x 8". 12 photos are housed in a smaller binder, the images measuring 6 1/4 x 5", and printed on thick photographic paper. They are in very good condition. The images were professionally photographed by Fred. Hess and Son, of Atlantic City. We estimate the date of the photographs to be the 1930s, on the basis of several things. Firstly the book was not published - perhaps a result of the financial crash of 1929 and the Depression of the 1930s. Fred. Hess and Son were in business from at least the 1920s through the 1950s. They printed postcards of Atlantic City and the Jersey Shore, right through Miss America Pageant photographs in Atlantic City in 1953. The binders themselves retain the stationers labels, which also places them in the 1920s. The small binder is from "Drimmer Press, 927 Broadway, New York." They appear in records of the NY Stationer's Association from 1918 - 1922. The large binders are from "Arrow Stationers, Sixteenth and Sansom St. Rittenhouse 7490." The collection is housed in 4 binders (3 large, 1 small). There are also about a dozen large photographs which do not fit into the binders, two copies of the form letter that Lefevre used to solicit help from other collectors, and about a dozen photographs that are not mounted on album sheets (some duplicates.) 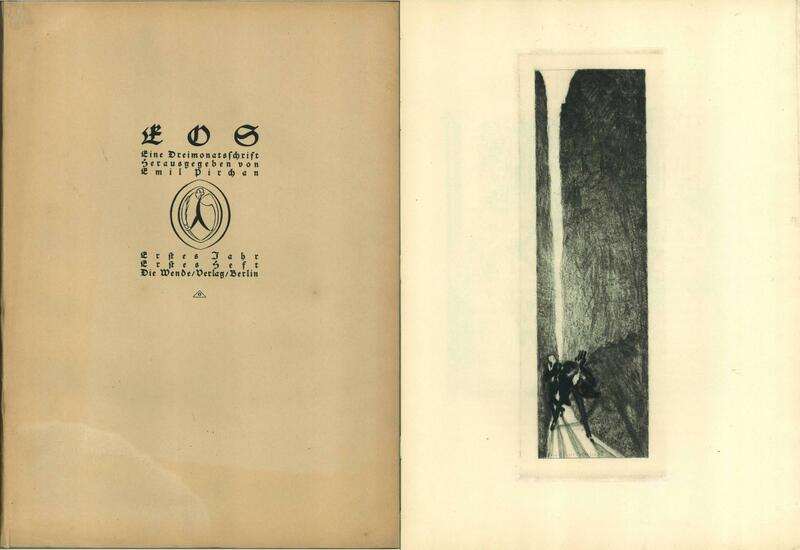 A remarkable collection of images, most likely unrecorded anywhere else, at least as a group. New York: Huebsch, 1920. First Edition. Hard Cover. Very Good+ binding. The First American Edition of what is perhaps the most important book to emerge from World War I, printed from the English sheets. Owen was killed in the last days of the war, and his friend, Siegfried Sassoon, fearing that the poems would be otherwise lost to obscurity, arranged for their publication in collaboration with Edith Sitwell. Owen's poems tell the truth about war, in contrast to the public perception of war at the time. With photogravure frontis portrait offset to the title page. A fragile item not generally found in this condition. With the front panel of the dustjacket laid in. On the rear endpaper, writting upside down in green ink "With the compliments of Le Petit Jardin February 1922". Some residue of old tape to the top of the pastedown. (Connolly, 36). Very Good+ binding. [N.p., Thailand: , n.d., 19th or 20th century], 1920. [N.p., Thailand, n.d., 19th or 20th century]. Ink on polished palm leaf in Thai script, 6 lines, with two holes for cords. 27 leaves. 3 x 24 inches. Wooden boards, with gilt decorations. Leaf edges partly gilt. Modern cord. Very good. Ink on polished palm leaf in Thai script, 6 lines, with two holes for cords. 27 leaves. 3 x 24 inches. Boston & New York: Houghton Mifflin at The Riverside Press, 1920. 4 volumes, 8vo, color frontispieces in each volume, plus reproductions of photographs and photographic reproductions of paintings and documents throughhout; original green cloth, gilt lettered spines, each volume in a quarter blue morocco slipcase with gilt lettering on spine; near fine throughout, boxes a little scuffed. Volume II is a first edition, the others are later printings. 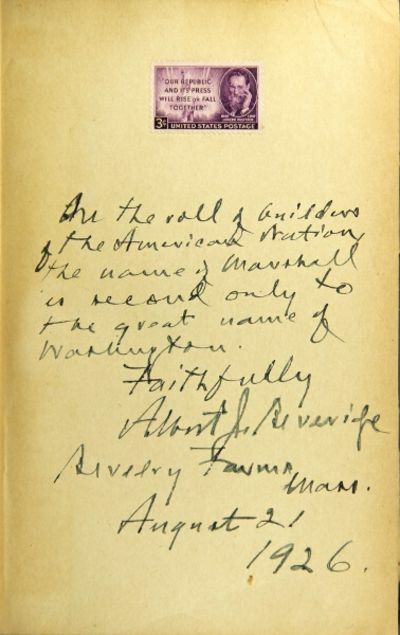 Volume I is warmly inscribed by Beveridge: "On the road of builders of the American nation, the name of Marshall is second only to the great name of Washington..." Signed in full, with a sentiment, and dated "Beverley Farms, Mass., August 21, 1926." London: Simpkin, Marshall, Hamilton, Kent & Co, 1920. 2nd edition. near fine/near fine. Small quarto. 184pp A near fine copy in an equally nice color pictorial dust jacket. 16 coloured illustrations by Florence Anderson and black and white illustrations by Clara Shirley Hayward. Maus, Delhalle & Urban ca. 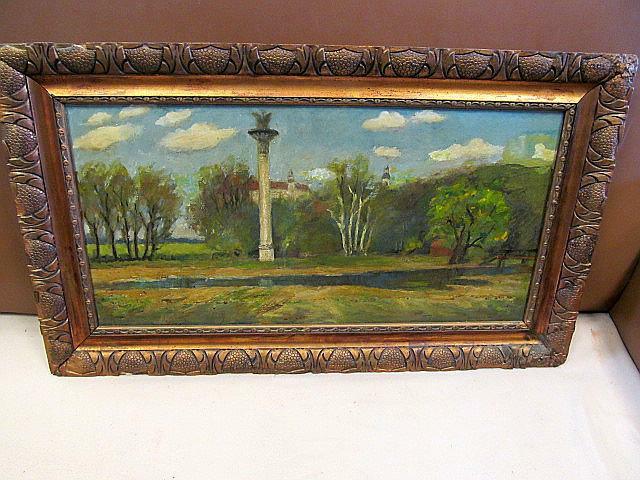 1920 - 111x71cm. Printed in full colours. St. Luc - Val d'Anniviers. -23 1920 - Ca. 150 Fotografien (zwischen 5-10 x 7-12 cm) mit 60 Negativen und 15 Postkarten. Lose in Pappmappe. Die Aufnahmen zeigen Ansichten der Dörfer St. Luc, Chandolin und Ayer, das Dorfleben, die Bauern beim Arbeiten, Gerätschaften, Gemeinschaftseinrichtungen und die Bewohner am Sonntag sowie Bilder von Bergwanderungen in der Umgebung von Zinal, Dent Blanche und Rothorn. Die meisten Fotos montiert mit Bildlegende. - Ferienfotos der Familie H.C. Kleiner, wohl aus Zürich. PRESTON, CHLOE. PRESTON,CHLOE. THE PEEK-A-BOOS AND MR. PLOPPER. NY: Hodder & Stought. no date, circa 1920. 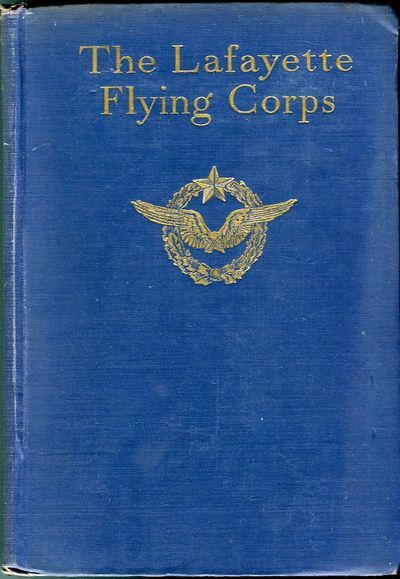 4to, boards, pictorial paste-on, slight soil rear cover and rubbing to paper on spine, VG+. 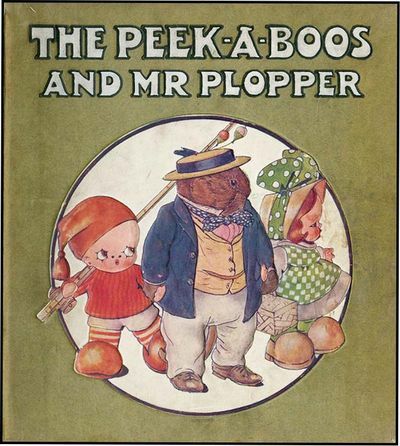 The 2 little Peek-A-Boo children hook up with a humanized beaver named Mr. Plopper. This features a world full of humanized animals on the order of Beatrix Potter but starring two wide-eyed little children. Illustrated with 8 color plates and many line illustrations. London: Nisbet & Co. Ltd.,, . Quarto. Original quarter vellum and white boards, titles to spine and cover gilt, patterned endpapers, top edge gilt, others untrimmed. With a maroon cloth solander case. Colour frontispiece and 9 tipped-in plates by Edmund Dulac, printed tissue-guards. Boards tanned, rubbing to corners and fore edge, light surface marks to rear board. A very good copy. 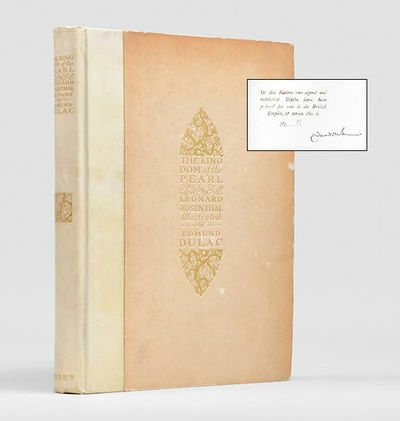 English signed limited edition (first published with Dulac illustrations in French as Au Royaume de la Perle, 1920), number 15 of 100 copies signed by the artist, out of a total edition of 775 copies for sale in the British Empire (an additional 775 copies were published for the USA by Brentano's, New York, 1925). Rosenthal was a famed Parisian jeweller who personally commissioned Dulac's illustrations. Routes Between Riyadh and Wadi Dawasir. London, Royal Geographic Society, 1920. - Colour-printed map (30 x 44 cm). Map showing Philby&#146;s route. 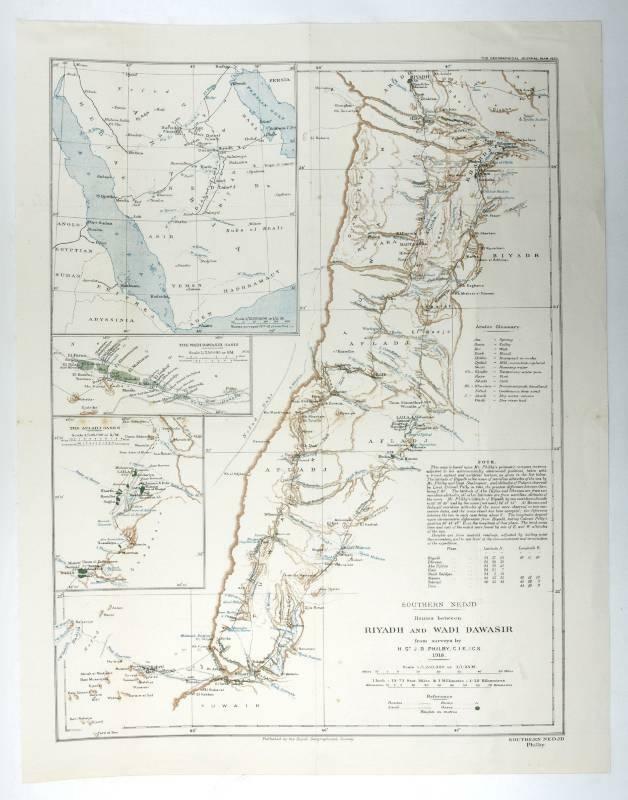 Inset of Central Arabia. Not in Ankary; Al-Qasimi. Acquafortisti italiani. Raccolta di acqueforti, acquetinte, puntesecche, maniera nera, di 150 artisti... Commenti di Raffaello Biordi e Alfredo Petrucci. a spese di Cesare Ratta, 1920. Tre volumi di cm. 36 con breve testo introduttivo al primo volume ed una raccolta di quasi 500 tavole complessive nei tre volumi. Legatura del tempo in mezza pergamena con piccole punte, dorsi a nervi con titoli su doppio tassello. Conservate le belle brossure edit. illustrate. Qualche menda ai dorsi delle legature, peraltro esmeplare ben conservato. Edizione di 500 esemplari numerati. Opera di assoluto riferimento in materia, non comune a reperirsi completa ed in perfetto stato di conservazione come per il presente esemplare. London; Shapiro. . Original Wraps. 8vo. pages. 23 cm. First edition. 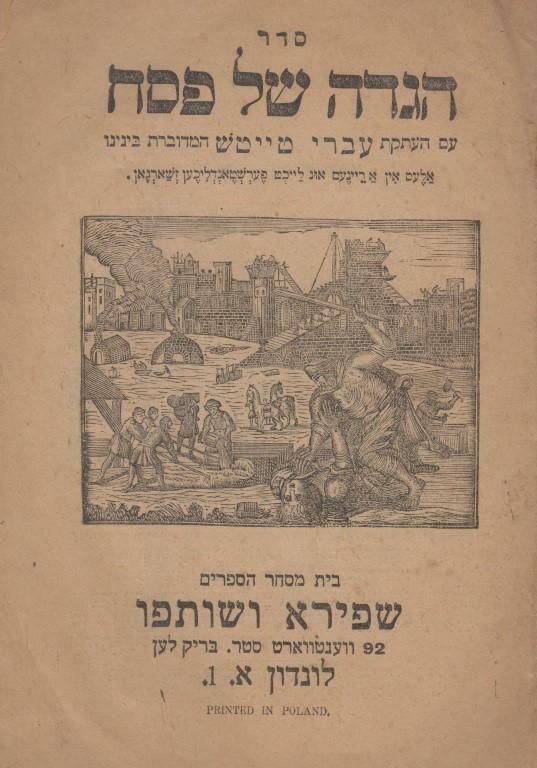 In Hebrew and Yiddish (described on title page as Â“TaytshÂ” and Â“ZhargonÂ”) . London Yiddish Haggadah. Subjects: Hagadah - Commentaries, Yiddish. Passover - Liturgy Â– Texts. OCLC lists one copy (Natl Libr Israel) . Pages aged and brittle, small edge wear and chipping to edges of rear wrap; small tear to last page, previously repaired. Scarce. Good condition. (HAG-13-43) . Schürmeyer, Walter Campendonk Katalog der Galerie Zinglers Kabinett, Frankfurt am Main 1920. Heft mit 2 Originalholzschnitten (Frau mit Blume, 1918, sowie Frau am Tisch mit Katze und Fisch, 1919) und 13 Abbildungstafeln in Kupfertiefdruck. 7 S. Text und Abbildungsteil. Orig.-Broschur mit Deckelillustration. Heftrücken mit leichten Läsuren, sonst sauberes ordentliches Exemplar. Die Grafiken mit schönem Relief in Art eines Reiberabdrucks. Privatverkauf unter Ausschluß der Gewährleistung. Abholung oder versicherter Versand für 7,50 Euro.